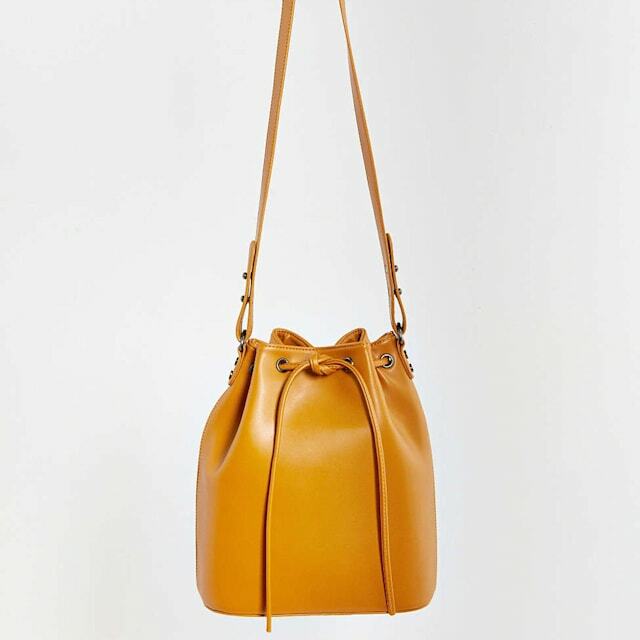 Cooperative Structured Bucket Bag, $54, available at Urban Outfitters. They may have scored their big break in Fall 2015, but that doesn't mean the bucket bag is going anywhere just yet. The fashion favorite has been a mainstay for seasons now, with celebrities and bloggers alike toting it around on the daily. If you haven't yet made the switch from tote to bucket, you might want to reconsider. Not only do the bags double as a crossbody, but its roomy interior gives you tons of space to store all your things. Not to mention, the design works for even the pickiest of fashionistas. They're really just the right fit -- structure but not too structured, and fashion-forward without being too out-there. Its silhouette really is universal. Of course, with every good trend comes a million different styles. While there may be seemingly endless options out on the market, our favorite iteration is Cooperative's Structured Bucket Bag, which comes in a range of colors including yellow, a metallic green, ivory, and deep blue. The drawstring closure and polished metal accents elevate the bag to give it a bit more of edgy flare, while also creating that coveted bucket shape. The additional roomy interior pockets also ensure that everything you need on your daily grind has a place. The affordable $54 price tag doesn't hurt either. It really is just as practical as it is pretty. It may just be the ultimate accessory to add to your fashion bucket list -- yeah, we went there. Finally! The beauty gods have shined on the lazy girl. This season, ready-in-minutes purposefully disheveled knots were all over the runways. Anything goes -- from exposed elastics to piece-y tendrils -- you really can’t mess up (ha ha) this undone updo. DIY: It may seem obvious, but second-day hair is a bonus for this bun. If you can’t go a day without sudsing up, texturizing gum will give your strands the same tousled texture. Here’s the color scheme that every It girl will be rocking. From teal to navy, and every shade of aqua in between, get ready for an Instagram feed full of ocean-inspired shadows. DIY: If blue eye shadow is giving you flashbacks (and not in the warm and fuzzy #TBT kind of way), try a subtler approach: Edge your eyes with aqua liner instead of saturating your entire lid. For fall polish, the options are pretty much endless. You can go playful with checkerboard nail art or make a moody statement with a rich navy or evergreen hue. But our favorite tones for your talons: the new neutrals. DIY: Stick to taupes, grays and golds that are just a hint more risqué than basic beige. You can never go wrong with healthy-looking hair, whether your go-to hairstyle is a sleek blowout or a polished ponytail. DIY: The key to shiny strands starts in the shower with gloss-boosting shampoo and conditioner. To keep the finished look from skewing greasy, use a light mist of shine spray on dry strands and avoid touching your tresses. This season, designers paid homage to a number of worthy decades -- we saw everything from mod ’60s-style twists to ’70s sparkle. DIY: Even the ’90s got a little love. Only this go-round, the grunge movement is getting a bit more glamorous with sultry, over-the-top smoked-out shadow. Eye-shadow looks ruled the runways, but when lips did have their moment, it appeared everyone was seeing red. DIY: You can’t go wrong with any shade --from cherry-stained to rich crimson -- but if you want to find the rouge that best matches your skin tone, we love the celebrity-inspired Exclusive Reds collection from L’Oréal Paris. Disco-era sparkle proved a staple on many designer runways, and though we loved ogling all the glitter, it’s the subtler shimmer that gave us good vibes. DIY: Love this look? Here’s our one-two trick: First, start by dusting your lids with a neutral eye-shadow shade. Then, simply smooth a dab of clear lip gloss over your lids. Some lucky girls can actually roll out of bed with hair that looks this gorgeous, but the rest of us have to try a bit harder to create this unkempt coif. DIY: Braid your hair into sections -- for thin hair, you can get away with just two braids; thicker hair may need a few more. Spritz your strands with a heat-protectant spray and allow them to dry fully. Heat the braid by running a flatiron over the length of your hair. Run your fingers through each braid to separate the waves and set with hairspray. Good news: If you’ve been practicing your cat eye all year long, you’re in luck. This graphic liner look isn’t going anywhere. In fact, it’s bolder than ever with accentuated “flicks” in the deepest, darkest black. DIY: To draw this dramatic line like a pro, you’ll want a felt liner with a flexible tip. Another must-have: ultra-lengthening mascara. Summer may have ended pretty abruptly, but you can take your time transitioning from beachy highlights to fall-toned tresses. This autumn, it’s all about golden brown and flaxen blonde. DIY: Inject a hint of honey into your strands with an at-home kit that comes with its own application tool. Our pick: Preference Glam Lights.